We had a great service Wednesday night in Hodgenville and then we left for Ohio a few minutes after 10:00. Last week we had a massive slow down as soon as we drove onto I-65 and we drove 20-30 MPH for about 40 miles. It took us way over 90 minutes to get near the south side of Louisville. That made for a very long night but this week all was clear. I have a very early morning scheduled with work on the house so I am typing this quickly and then heading for bed. Dad sent pictures yesterday of the gravel being added inside the block and dirt being added to the outside. Here are a couple. 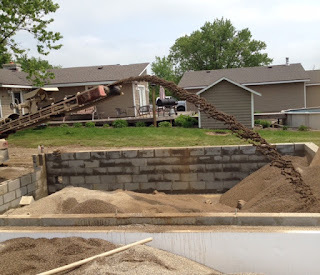 We have two more loads of gravel coming this morning and then the plumber and HVAC guy should start on their part. It is raining cats and dogs right now and the weather guessers are predicting rain all day. Hopefully they can get some of their work completed. We also have a few things to run for the electricity. I will have pictures from our whole week tomorrow. Thank you for reading.